Alice Eunice Hinshaw4 [Eunice Alice Hinshaw2,5,6,7,8]. Foster, Clarence, head-of-household, age 33, born in Missouri; parents born in Missouri; owned home; occupation: farmer. Foster, Eunice, wife, age 27, born in Missouri; parents born in Missouri. Foster, Alberta, daughter, age 1 year 2 months, born in Missouri; parents born in Missouri. Foster, Clarence, head-of-household, age 42, born in Missouri; parents born in Missouri; first married at age 22; rented home ($60 rent); no radio in home; occupation: waiter, hotel; not a war veteran. Foster, Eunice, wife, age 38, born in Missouri; parents born in Missouri; first married at age 17; occupation: proprietor, delicatessen. Foster, Alberta, daughter, age 11, born in Missouri; parents born in Missouri; attended school. 1920 census, Cedar Township, Boone County, Missouri; roll T625-906, ED 6, page 1A, line #29, dwelling #8, family #8. 1930 census, 27th Ward, St. Louis, Missouri; roll T626-1245, ED 228, page 14A, line #1, dwelling #203, family #262. 1900 census, Cedar Township, Boone County, Missouri; ED 16, page 49A (sheet 1A), line #40, dwelling #10, family #10. Contribution from Sondra Swinford citing: Foster family bible. 1920 census, Cedar Township, Boone County, Missouri; roll T625-906, ED 6, page 1A, line #32, dwelling #9, family #9. 1920 census, Cedar Township, Boone County, Missouri; roll T625-906, ED 6, page 1A, line #18, dwelling #5, family #5. 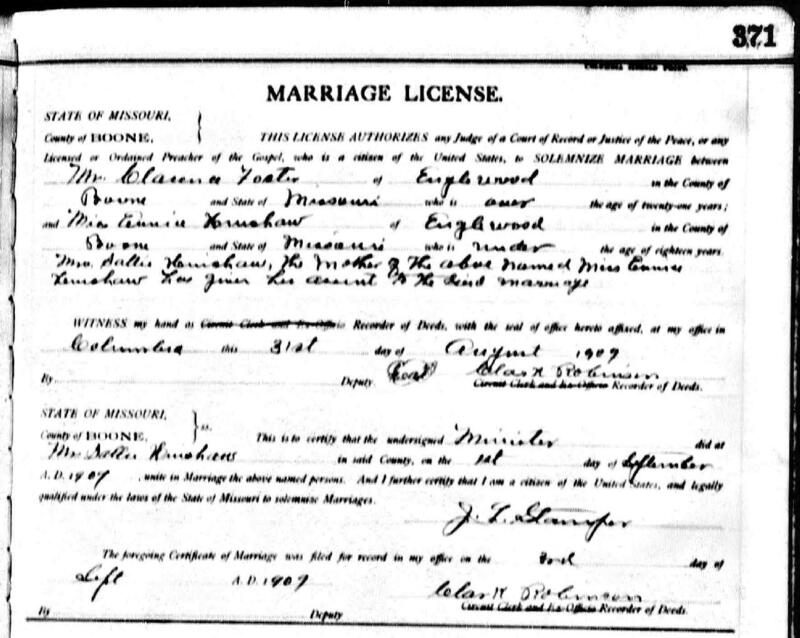 Contribution from Sondra Swinford citing: marriage certificate.